Who knew I'd miss being here as much as I have the past few weeks? I'd hoped to be back posting last week when we returned from the wedding in OK. Unfortunately, my granddaughter and I brought back head colds. We're still recuperating but I just haven't felt up to getting on-line much. Aside from the extra time doctoring her. For the next few weeks, the postings probably won't be Magazine Inspired creations, but I will feel blessed in having eeked out some time to play with my toys and share those creations with you. The card today was inspired by music note paper I received in my monthly swap I belong to on SCS. I kept it simple, accenting with SU- black and very vanilla. The stamp is SU Many Thanks. The musical score bars are from a sticker sheet by Hot off The Press. They were part of my Secret Sister package from Maggie back in December. 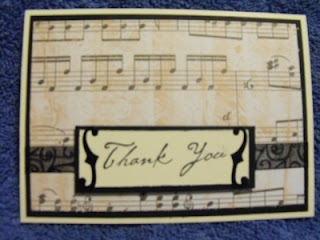 The other inspiration for the card was I needed a Thank You card for a friend in Texas. W.C. Jameson is a talented author and musician. I've known him for almost twenty years and am always in awe when I get one of his new CDs in my hands. Since I no longer see him every October like we used to, I asked if he would send me his most recent release. The music truly does come from his soul. His non-fiction writings as a treasure hunter are true adventures that have led this man all around the country. I cherish the friendship I have with WC and his wife Laurie. If all goes well, I'll have another card to post later in the week.